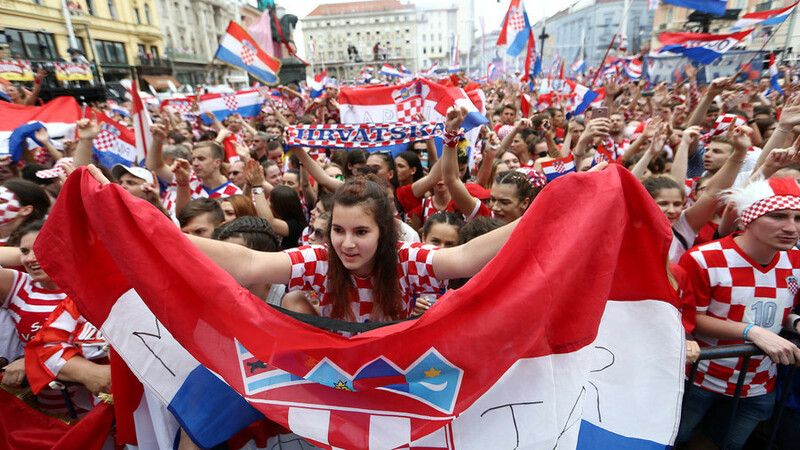 The Croatian team have been greeted by thousands of fans on their return to Zagreb after their historic run to the World Cup final. Croatia reached the final for the first time, ultimately falling to a 4-2 defeat against France at Luzhniki in Moscow on Sunday. Despite the defeat, the team has been hailed for its achievements in taking a nation of just 4.17 million all the way to the final of football’s biggest tournament. On arriving back in the Croatian capital Zagreb on Monday, they players were met by thousands of cheering fans who lined the roads as the team made their way from the airport to the city in an open-top bus. Players including captain Luka Modric, won the Golden Ball for the player of the tournament in Russia, were seen waving to fans and cheering. The Croatian team went one better than their countrymen in 1998, who reached the semi-finals of the tournament in France. Davor Suker, a key member of that team, was in attendance at the celebrations in his role at the head of the Croatian football federation. Croatia won praise for their gutsy performances in Russia allied with no little skill, which made light of their smaller status in terms of population. They recorded a thumping 3-0 win against Lionel Messi and Argentina in the group stage, and overcame Denmark and Russia on penalties in the knockout stage, before coming from behind to beat England in extra-time in the semi-final. The went down to defeat against France in the final on Sunday thanks to an own goal from Mario Mandzukic, a penalty from Antoine Griezmann, and second-half goals from Paul Pogba and teenage star Kylian Mbappe, although Ivan Perisic and Mandzukic got on the scoresheet in reply. The team was backed by what appeared to be a larger fan presence than France inside Luzhniki, with the crowd of Croatian fans in red and white continuing to salute their team long after the final whistle.